Oops - we don't appear to have a video for the DR-F120. This was purchased as an upgrade to my old scanner that had served me well. It was quicker in mono mode andI was able to set up user profiles & settings. I would recommenf this unit. Great Product. Very easy to set up, simple to use. Whizzes through all our paperwork, double sided too and copes with passports, credit cards and other various sized items too. Ordered it 5.15 one evening and it was delivered the following morning at 9.30! Excellent service! I am surprised that so much is available at such a small price. The machine is fast and flexible. Using it with FileCentre, my documents management program, I can scan a double-sided document to the open folder and rename it on the fly quickly and effortlessly. It has made easy what was previously a chore and a good step to the (mythical?) paperless office. Highly recommended. Capture various types of document types accurately and efficiently with the DR-F120: a compact all-in-one scanning solution that offers both an automatic document feeder (ADF) and flatbed. You can save yourself valuable time using the 50-sheet document feeder, with its faster 20ppm scanning speeds. The DR-F120 can be relied on to get through your work with a suggested daily volume of up to 800 scans. The DR-F120 gives you complete flexibility to scan a wide range of materials despite its compact body size and small footprint. The straight-through ADF path accommodates A4-width documents, and media of up to 1,000mm in length. You'll enjoy increased reliability and time-savings when scanning mixed documents as a result of the separation roller in the feeding mechanism. The flatbed scanner is ideal for handling media like books, passports or magazines, and effortlessly captures pages up to legal size. It's equally at home with photos or other thick, thin and delicate documents. The DR-F120 delivers superior quality results time after time, due to its 600dpi scanning, wide range of built-in image enhancement features and Canon's renowned imaging technology. You'll achieve unprecedented colour accuracy that stays true to the original document via the scanner's 3-Dimensional Color Correction function. Achieve superb results with just a single touch of a button using the Full Auto Mode that automatically applies the best settings for each scanned image. Built-in tools eliminate blank pages and automatically detect paper size and text orientation; while the automatic deskew feature straightens documents fed at an angle. Frequent tasks can be made even simpler by assigning them to 3 job buttons on the scanner panel. The DR-F120 offers a simple and intuitive scanning experience using Canon's CaptureOnTouch 3 software. 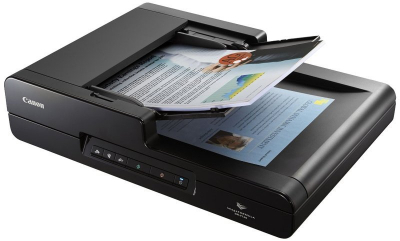 Users can scan, edit and send their documents even more easily with this versatile scanning solution. Its step-by-step icon-based user interface lets users quickly convert their paper documents to multiple file formats (PDF, TIFF, JPEG, BMP, PNG and PowerPoint). CaptureOnTouch is equally capable as a simple document filing solution that lets users scan and create searchable PDF documents – including easy text-based search and retrieval. Cloud plug-ins to SharePoint, SugarSync, OneDrive, Dropbox, Google Drive™ and Evernote are included, ISIS and TWAIN drivers are also provided. DR-F120 is easy to maintain because of its user-friendly design. The feed rollers are user-replaceable, which means you won't incur the cost of calling out a service technician. Your costs stay low due to the scanner's high energy-efficiency, using less than 20W in operation.